The Illinois State Charter Commission is in danger. Founded in 2011, the role of the Commission is to be a neutral decision-maker for charter schools to appeal decisions made by local school boards. If a request to open a charter school does not get approved at the local school board level, those who want to open a charter school can then apply for approval by the Commission. It serves as a reasonable, common-sense check on school districts – helping keep politics out of the charter school approval process. Opponents of the Commission have tried to say that it goes against school districts and undermines local control. This is not true. Almost all of the time, the Commission agrees with the school boards’ decisions on opening and renewing charter schools. Since 2011, the Commission has agreed with the local school board 86 percent of the time. Special interests really want to abolish the Commission because that would eliminate an opportunity for charter schools to get a fair chance to open and get renewed. Without the Commission, local school boards could reject charter applications for no reason at all – without any appeals process. 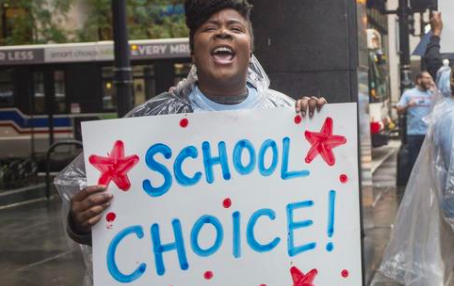 If the Commission is abolished, an anti-charter school board could close a charter school and force families to find a new school for their children. They could make unnecessary requirements for charters to operate and renew their schools. They could refuse to authorize the renewal of a high performing school and effectively close the school without any sort of appeal. This could hurt our schools, students, and families. This veto session, we ask that Illinois lawmakers uphold the veto of HB 5175 and maintain the Commission – for the sake of families across Chicago. You can take action by visiting here. Please take a minute to send a message to your elected leaders and take a stand for our schools!